Springtime in Japan is a time for holidays; most notably, Golden Week, which is a collection of several national holidays including Showa Day, Greenery Day (Midori no hi), and Children’s Day (Kodomo no hi), which is from late April to the early May. But while the holiday is named after the glittering gold color, Golden Week in Hokkaido isn’t gold, rather, it’s pink. While Honshu is finishing up Japan’s iconic cherry blossom season (Sakura), spring is just starting to flourish up in Hokkaido as the last of the snow melts away to reveal the gorgeous colors of this northern island right as the holiday season rolls around. It’s in this season that the Sakura trees bloom in Hokkaido, dotting the city with a light pink color. 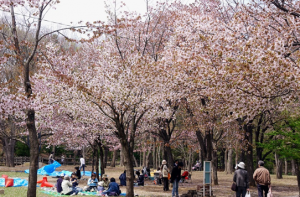 Hanami (flower viewing) is a particularly loved pastime for Japanese during this time, and one of the most popular spots is Maruyama Park. Here, Sapporoites gather to cook Hokkaido-specialty dish Genghis Khan—which is grilled lamb and mutton with plenty of vegetables and a special sauce—beneath the trees and admire the view. It can get a little smoky from all the barbequing, but watching the delicate flowers float down while the succulent smells of grilled meat waft through the air on a fine spring day is certainly a unique-to-Hokkaido experience. Neighboring the park is Hokkaido Shrine, which also boasts being a popular hanami spot since 1900 with its 1,400 cherry trees and 250 ume (plum) trees. Celebrate spring with “Jingo no Ume” plum wine and “Jingu no Sakura” cherry blossom tea which is made on the premises and sold exclusively at the shrine. Less known but certainly equally as beautiful are the ume plum blossoms, which bloom around the same time as Sakura in Hokkaido. The most prominent place for viewing ume is at Hiraoka Park in Sapporo, which celebrates the annual Ume Matsuri and many ume-inspired products such as ume flavored ice cream and soba. 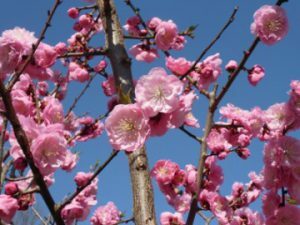 Like the Sakura, Ume blossom are short lived, only blooming for around two weeks and often only in full bloom for a single, fleeting day. The ume forest here is the perfect place to go for a walk during this short-lived period to enjoy the fine, sweet scent of plum. Floral blooms in Sapporo do not always coincide exactly with Golden Week. Sapporo’s three main types of Sakura (Ezoyama cherry, Yoshino cherry, and Yaezakura cherry) bloom at different times until the end of May and last year’s Ume blossoms were in full bloom after the holidays had ended. So there are plenty of opportunities to enjoy the scenery without all the people in the way. By all means, come visit Sapporo in the spring and see this unique, pink season.